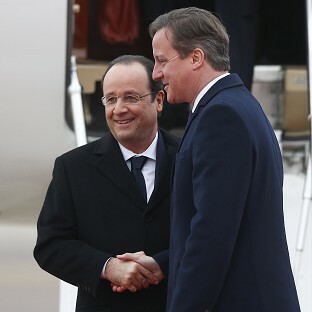 Prime Minister David Cameron and President François Hollande held a mini Anglo-French Summit today at RAF Brize Norton in Oxfordshire. Military co-operation was part of the discussions, with advancing the Anglo-French drone programmes a key item on the agenda. While there is little detail yet, it has been announced that the two countries have agreed to commit a further £120m to the Future Air Combat System programme for a further two-year feasibility study led by BAE Systems and Dassault Aviation. The Future Air Combat System is a programme of ongoing work on future unmanned combat systems. The UK MoD awarded £40m of funding to this programme in January 2012 and in July 2012 France and UK jointly awarded Euros 13m towards the programme. In November 2010, David Cameron and Nicolas Sarkozy signed The Declaration on Defence and Security Co-operation (dubbed ‘the entente frugale’) which contained a specific commitment to work together on unmanned systems. BAE Systems and Dassault immediately announced they were working together on plans to develop a new Medium Altitude Long Endurance (MALE) drone, the same category as the US Reaper and Predator. This drone, named Telemos, was expected to be given the go-ahead at the 2011 Paris Airshow, with BAE and Dassault fully expected their respective governments to sign contracts. However at the airshow everything was abruptly put on hold for 18 months, apparently due to the new French administration wanting to ‘go back to square one’ on the concept, but it soon emerged there were other issues, including a wish by the French to bring Germany into the project as well as apparent budgetary concerns. In February 2012 Cameron and Hollande signed a new declaration, again affirming their commitment to working together on unmanned systems but there was little detail. The two countries agreed to investigate the possibility of working together on an advanced combat drone, with France agreeing to evaluate the much delayed Anglo-Israeli Watchkeeper drone. There were vague mentions of a possible MALE drone, but a year later France was negotiating to buy Reaper drones from the US, much to the anger of the French military industry, and all talk of building a new MALE drone to rival Reaper has been shelved. Today British Reapers are on operations in Afghanistan while unarmed French Reaper drones are operational over Mali. Rather than working together to build an alternative to Reaper, the focus is now on developing the next generation of drones under the Future Air Combat System. These drones will be much faster, stealthy, more autonomous, have a greater range and be able to defend themselves from attack unlike the Reaper generation. In the US, we have seen over the past year Northrop Grumman’s X-47b advance unmanned combat drone undertake test flights from an aircraft carrier and Lockheed Martin revealed that it has been working on plans for the SR-72, an unmanned hypersonic aircraft. In the UK, BAE Systems have been working on their Taranis drone and it is thought that the work on the Future Air Combat System is separate but parallel to this project.